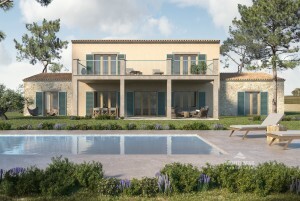 Luxury Fincas & Villas for Sale in Santanyi | Montemar S.L. Located in the southeast, Santanyí is situated in the Migjorn region. The well-known neighbouring communities are Ses Salines, Campos and Felanitx. Santanyí is particularly popular because of its 35 kilometres of coastline, which is part of the municipality. Geographically it is also worth mentioning that the southernmost point of Mallorca, the Cap de Ses Salines, also belongs to Santanyí. For your real estate investment in Santanyí there are over 120 square kilometres of land available. With Montemar Real Estate, it will not be an issue to find a beautiful and exquisite villa or a finca equipped with all the comforts you would expect from an upscale property. Our offers contain details on location, furnishings and other aspects; you decide for yourself which properties in Santanyí - or perhaps in one of the 10 other towns in the municipality - could be considered as possible residences: we have the best offers for you, which are suitable for your high standards. Depending on where you find your luxury residence in Santanyí, you are just a little more than 50 kilometres away from Palma - but living in Santanyí and its surroundings means you don't have to give up anything. The mild, very short winters and the warm, wonderfully beautiful summers on the Mediterranean are another reason for a luxurious residence or second home.